The rules are plainly posted at the path entrance near Albany Station. 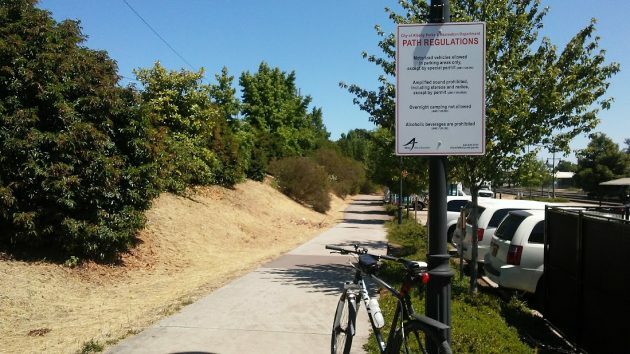 Applying park regulations to a path is one thing. Making them stick is something else. Take a look, for example, at the path alongside the Union Pacific right-of-way from Albany Station to Swanson Park. Take a look and be dismayed. In April, the city council adopted a resolution declaring the path and one on the other side of the Pacific Boulevard viaduct to be part of the Albany park system. The idea was that park regulations would then be applied, and this would make it easier for the city to keep camping and carousing along the path under control. The biggies: Overnight camping is not allowed. Alcoholic beverages aren’t either. Maybe it wasn’t overnight, but there is ample evidence of camping, evidence left behind by people not accustomed to cleaning up after themselves. The corridor along the railroad track has become a dump for all manner of trash, mostly the stuff that comes with eating and living outdoors. And under the overpass, the path is still a place where taggers, evidently undisturbed, leave their ugly work. Looks like somebody had a camp here regardless of the park regulations. 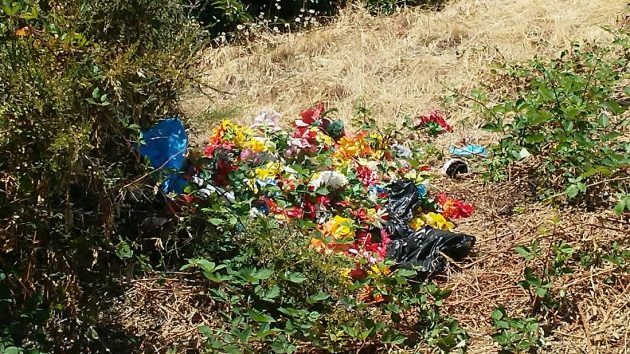 Trash near the path includes a load of some pretty colorful stuff. The view from the path under the overpass. You can just see the water slide at Swanson Park. I rode my bike down there last week and just like you, I was disheartened and dismayed at the trash, graffiti and evidence of camping. This is certainly not a place that I would want to walk at night or a place I would feel comfortable sending my children unaccompanied. 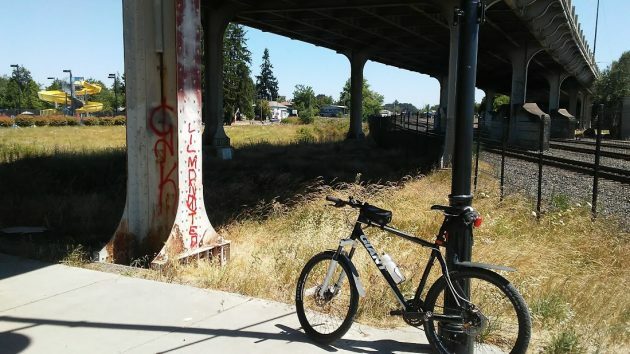 Another bike path that has some nefarious activity is behind the new Lowe’s & Kinder Park. At least I’ve seen APD clearing out this area from time to time. We’ve somewhat affectionately nicknamed it the “thieves forest”. Frustrating and sad. 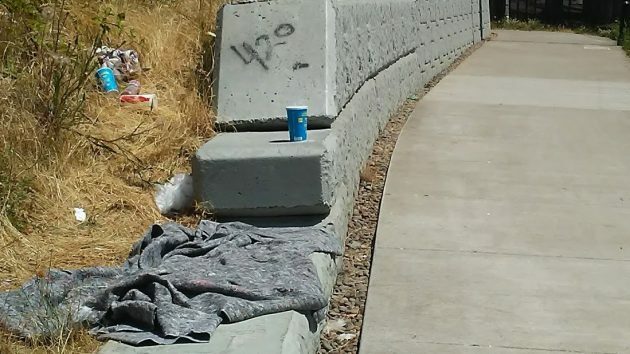 Albany has got to start addressing the homeless issue. Some are homeless because they are incapable of accessing social services due to mental illness, addiction etc. Some are homeless because they can’t afford housing and some are just unwilling to provide for themselves. However, I was trying to help a friend who lives in Salem find new housing. The person is retired and has a small pension and Social Security The landlord just sent out letters that the rent is going from $625 to $845 per month. So I suggested we take a look in Albany. STICKER SHOCK! There’s been no raise in Social Security for the past 2-3 years. And Social Security is being used for other than it’s intended purpose, but that’s another issue. Anyway, as long as the homeless have no advocacy and no options, the problem will continue to grow. The City of Albany has taken lots of action on the ‘homeless issue’, including being part of the national 10-year plan to end homelessness started back in 2000. Many meetings are being held, lots of money is being spent, and resumes are being bolstered. Best of all, everyone in the process feels good about themselves. Applying government metrics, the program has been a roaring success. I just wish the vagrants would stop leaving bicycles laying around on our public byways. Hasso without you no one in Albany would know what is going on. Don’t ride a bike anymore but those that do should br able to ride on paths that are clean and safe. The shelter is a good place but i have found out that a lot people who live there get SSI or SSD and on payday they get a motel and party till the money is gone and back to the shelter they go. Some people choose this life; it does not bother them at all; they are fed good and the shelters house them. They even sell there Food Stamps or trade for drugs. We give them this opportunity by taking care of them after they spend a week on a binge. It’s sad and we (the community) needs to stop letting those people abuse the system. The problem there is if we stop giving they take. It’s a lose-lose situation. I agree with you Sandra. The only solution here is to only allow them to get assistance if they hold a job. One thing that has made me a successful parent is by teaching my kids that there are consequences to their actions. Albany needs to learn this when dealing with the homeless and those who deal or do drugs and abuse the system.